Services are scheduled for 10 a.m. Thursday, Oct. 19, at Trinity Temple Assembly of God for Ishmael G. Valenzuela, 72, of Artesia. Bobby Argo will officiate the services, with interment to follow at Woodbine Cemetery. Pallbearers will be his grandsons, Nathaniel Otero, Isaac Valenzuela, Phillip Otero, Jacob Valenzuela, Joshua Valenzuela and Cianne Montes. Honorary pallbearers are Josiah Valenzuela, Roman Valenzuela, Araceli Anaya and Kyle Leyva. Visitation will begin at 3 p.m. Wednesday at Terpening & Son Mortuary. Ishmael was born Feb. 11, 1945, in Mulato, Ojinaga, CHH, the son of Mariano and Petra Valenzuela. 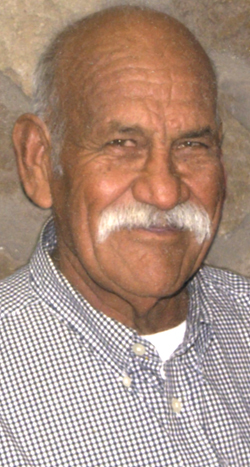 He was a resident of Artesia since 1957. On Jan. 16, 1966, he married Erma Valenzuela in Artesia. Ishmael was an extremely hard worker in the oil and gas industry. He was also self-employed in the trucking industry. Upon retirement, he took up lawn maintenance in the community, as he enjoyed staying active. Ishmael was a sports fanatic, whether he was coaching baseball for his sons, playing softball, or rooting for his Broncos. He was also an avid fan of old western movies. He left behind a strong work ethic that will be with us forever. Survivors include sons Rick Valenzuela and wife Heather of Albuquerque, Ismael Valenzuela Jr. and wife Paula of Augusta, Ga., and Javier Valenzuela and wife Kathleen of Artesia; daughters Hilda Valenzuela and Joelda Otero, both of Albuquerque, and Joann Anaya and husband Oscar of Artesia; and grandchildren Jacob Valenzuela, Nathaniel Otero, Joshua Valenzuela, Kyle Leyva, Phillip Otero, Josiah Valenzuela, Isaac Valenzuela, Roman Valenzuela and Araceli Anaya. He was preceded in death by his loving and caring wife, Erma, and his siblings.